It’s pumpkin time again. Halloween, tonight, October 31st. Halloween is not really a vital tradition here in Mallorca, nor anywhere else in Spain but, with globalisation abound, you can now find halloween parties on the island as well. Children have not adapted to the tradition, yet. No Trick or Treat. If anything, Halloween is a party thing here with youngsters dressing up in witches’ costumes or vampires’ outfits. Carabasses, the Mallorcan pumpkin variety, will be celebrated in November. 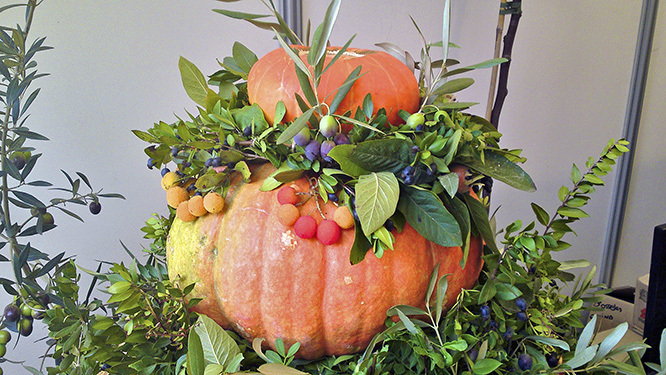 The Fira de Tardor will be held in Muro on Sunday, November 13th, incorporating the Concurs de Carabasses (pumpkin competition). Last year, they had pumpkins in excess of 200 kilogrammes a piece, albeit from the mainland and thus, outside of the competition. The Ajuntament offered dried seeds of those monsters, later in the year. If you had put your name down, you would have been given five giant pumpkin seeds to try your own luck with. We did, and we had three successful off-springs, weighing in at almost 20 kilogrammes each. Nor bad for pumpkin dummies such as ourselves. The photo was taken in Porreres, Mallorca, Baleares, Spain. The date: October 30th, 2011. The time was 11:14:56.